The customised irrigation system design service offered by North Rocks Lawn Mowing Services helps garden owners in efficiently controlling and managing their water resources using quality products and advanced design strategies. We pride ourselves on listening to our customer's needs - then we apply ourselves to the job with zeal and enthusiasm! North Rocks Lawn Mowing Services offers effective installation services for a range of landscape elements, irrigation systems and reticulation systems. The landscape elements and plumbing products supplied by North Rocks Lawn Mowing Services are manufactured according to industrial quality standards. Drip irrigation, also known as trickle irrigation, functions as its name suggests. Water is delivered at or near the root zone of plants, drop by drop. This method can be the most water-efficient method of irrigation, if managed properly, since evaporation and runoff are minimized. In modern agriculture, drip irrigation is often combined with plastic mulch, further reducing evaporation, and is also the means of delivery of fertilizer. The process is known as fertigation. Deep percolation, where water moves below the root zone, can occur if a drip system is operated for too long of a duration or if the delivery rate is too high. Drip irrigation methods range from very high-tech and computerized to low-tech and relatively labour-intensive. Lower water pressures are usually needed than for most other types of systems, with the exception of low energy centre pivot systems and surface irrigation systems, and the system can be designed for uniformity throughout a field or for precise water delivery to individual plants in a landscape containing a mix of plant species. Although it is difficult to regulate pressure on steep slopes, pressure compensating emitters are available, so the field does not have to be level. High-tech solutions involve precisely calibrated emitters located along lines of tubing that extend from a computerized set of valves. Both pressure regulation and filtration to remove particles are important. The tubes are usually black (or buried under soil or mulch) to prevent the growth of algae and to protect the polyethylene from degradation due to ultraviolet light. But drip irrigation can also be as low-tech as a porous clay vessel sunk into the soil and occasionally filled from a hose or bucket. Subsurface drip irrigation has been used successfully on lawns, but it is more expensive than a more traditional sprinkler system. Surface drip systems are not cost-effective (or aesthetically pleasing) for lawns and golf courses. In the past one of the main disadvantages of the subsurface drip irrigation (SDI) systems, when used for turf, was the fact of having to install the plastic lines very close to each other in the ground, therefore disrupting the turfgrass area. 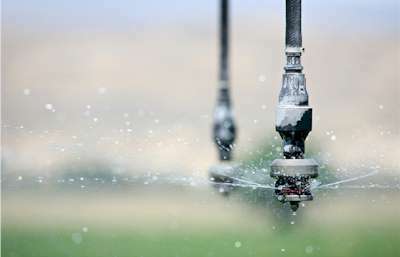 Hi pressure sprinklers that rotate are called rotors and are driven by a ball drive, gear drive, or impact mechanism. Rotors can be designed to rotate in a full or partial circle. Guns are similar to rotors, except that they generally operate at very high pressures of 40 to 130 lbf/in² (275 to 900 kPa) and flows of 50 to 1200 US gal/min (3 to 76 L/s), usually with nozzle diameters in the range of 0.5 to 1.9 inches (10 to 50 mm). Guns are used not only for irrigation, but also for industrial applications such as dust suppression and logging. Automatically moving wheeled systems, known as travelling sprinklers may irrigate areas such as small farms, sports fields, parks, pastures, and cemeteries unattended. Most of these utilize a length of polyethylene tubing wound on a steel drum. As the tubing is wound on the drum powered by the irrigation water or a small gas engine, the sprinkler is pulled across the field. When the sprinkler arrives back at the reel the system shuts off. This type of system is known to most people as a "waterreel" travelling irrigation sprinkler and they are used extensively for dust suppression, irrigation, and land application of waste water. Other travellers use a flat rubber hose that is dragged along behind while the sprinkler platform is pulled by a cable. These cable-type travellers are definitely old technology and their use is limited in today's modern irrigation projects. North Rocks Lawn Mowing has the service for you!